To cite: Prakash Panneerselvam. 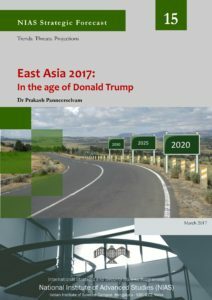 “East Asia 2017: In the age of Donald Trump,” NIAS Strategic Forecast No. 15. Bangalore: International Strategic and Security Studies Programme, National Institute of Advanced Studies, March 2017. The power relationship in East Asia depends on the interaction between the three big powers – the US, China and Japan. In the age of Donald Trump, East Asian countries are worried about Trump’s precarious view on the alliance system and regional affairs. The sea-change in the US foreign policy has not only created uncertainty on the economic and strategic front but it also significantly impacted the fate of East Asia. This report examines and assess responses of Japan, Korea and China to Trump besides looking at emerging issues in the region that might pose a serious challenge to the new US administration. About the Author: Prakash Panneerselvam, Post-Doctoral Associate, ISSSP, NIAS, Bengaluru.